Lantern Theater Company gift certificates make great gifts for any occasion! Giving the gift of great theater has never been easier. Our gift certificates are fast, easy, and guaranteed to get rave reviews. The perfect gift for couples on your shopping list – or for you and your special someone! Your gift pack includes a Tix-for-Two gift certificate valid for any Lantern Theater Company performance plus a $50 gift card to your choice of our Dining Partner restaurants. Prefer to order by phone? Please call 215.829.0395 during regular Box Office hours. 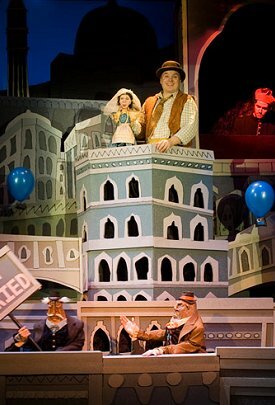 Pictured (clockwise from top): Benjamin Lloyd, Mathew Wright, Bradley K. Wrenn, and Leah Walton in Scapin (2009). Photo: Jeffrey Stockbridge.